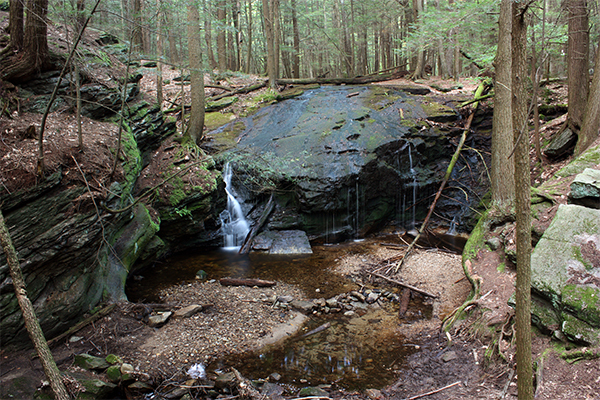 This waterfall, often called Hop Brook Falls, falls over a modest-sized clam-shaped ledge. Surrounded by very attractive woods, the drop begins as a spreading slide before plunging a final 6 feet to a shallow pool below. It is extremely rare that water flows over the entire formation. If you happen to visit on a day in which water is flowing that well, you will be witness to the full beauty potential of these falls. This is another waterfall where it's always the case that the more water there is, the most scenic the falls are. Access to these falls has changed significantly if you haven't hiked here in a few years. The Metacomet-Monadnock Trail no longer passes through this area, and many of the smaller falls downstream of the main falls are likely to fall into obscurity because they all must now be bushwhacked to. The good news is that the new trail provides far easier access to the falls than ever before. This is a hike that is, for the first time, family-friendly. From the parking area, follow an unmarked trail that begins by climbing slightly uphill, heading northeast. After only 50 feet, the brook will come into view on your right. Travel upstream with the brook on your right for 0.2 mile and then bear left onto a yellow-blazed trail. Back in the day, the trail would have actually crossed the brook here and headed directly upstream (with the brook on your left), but that now-retired trail has become so heavily overgrown and eroded that the yellow-blazed trail is now the official route to the falls. Follow the yellow-blazed trail for 0.3 mile as it leaves sight of the brook at times. You will find the 15-foot main falls a short distance on your right just as the trail starts getting closer to the brook after ascending several moderate hills. The falls are not directly beside the trail but you should be able to see where the brook drops off significantly. I recommend crossing the brook above the main falls and heading 100 downstream, where there is a fine heads-on view from the top of a parallel gorge wall. While it is still physically possible to hike up and downstream directly beside the brook, with each years' passing that retired path is likely to become even more eroded and overgrown. I took this adventure in 2017 and I would not recommend it unless you are really determined to see (or photograph) some of the small but pretty cascades that lie downstream of the main falls. From the eastern junction of MA 9 and MA 116 in Amherst, take MA 9 east for 6.1 miles (or 3.1 east of the "Entering Belchertown" town line sign) and there is a small dirt parking area and pull-off on the left. A small sign for the Metacomet-Monadnock Trail (the "M&M Trail") currently marks the spot, but this sign is extremely likely to be removed at some point as the M&M Trail has been rerouted elsewhere. This parking area is 2.7 miles northwest of the junction of MA 9 and US-202 in Belchertown. To get to Amherst, take I-91 north from Springfield to exit 19. Follow MA 9 east.